Woah, more than 400 followers! I never expected to get so much followers and I really appreciate it <3 Thank you all for visiting my blog! Today I'm wearing 3 thin coats of Catrice Let's Mauve On! 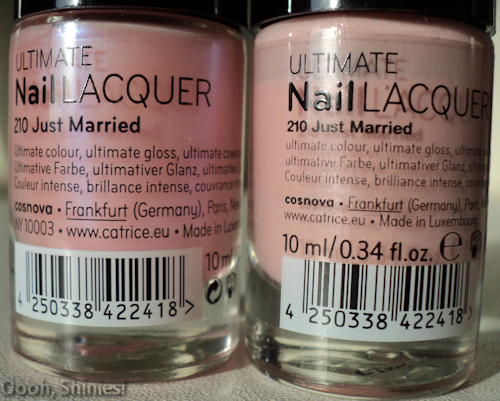 and topped it with 1 coat of the new version of Catrice Just Married. 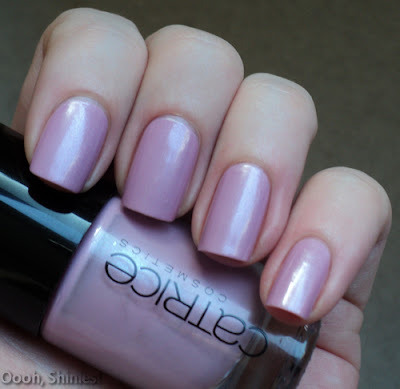 Here's Let's Mauve On! on itself, a purple-ish mauve with a light shimmer. Looks a bit darker and more purple irl, as the bottle shows a bit. When I saw Just Married in the stores I already suspected it would be a layering polish and I'm not too crazy of that. But when I saw the name I bought it anyways, because I thought I already had a Just Married at home and as it turns out, I indeed did. On the left is the new version that's in stores now, on the right is the old one, a light pink with shimmer. This combo reminds me a lot of China Glaze's Tantalize Me! I'm very curious how Just Married will look over some other colors, especially black and blue.